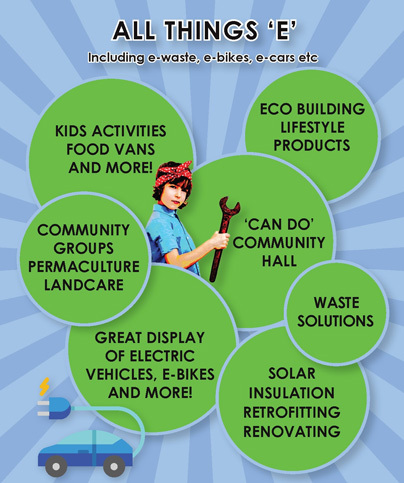 The Buninyong Newsletter is produced by the Buninyong and District Community Association. 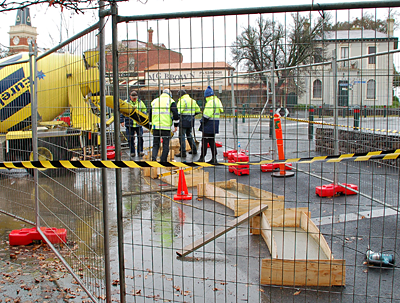 Making Buninyong has frequent newsy postings about what's going on in Buninyong. 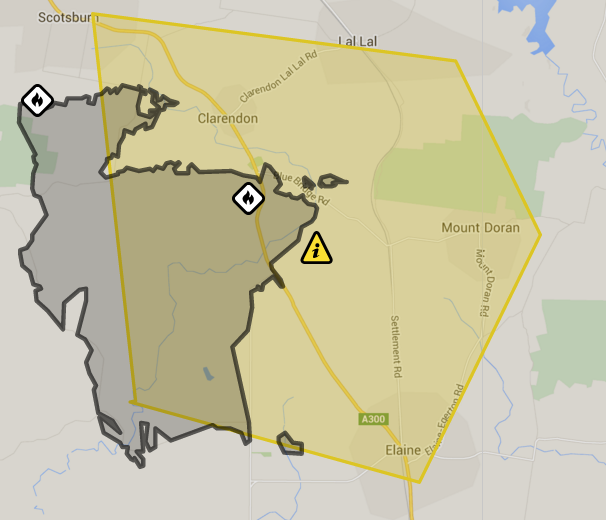 Read Deb's Making Buninyong posts on Facebook here. Saturday 30 March - Music Festival kicking off at 11am. Artists will be performing at a number of venues around the township of Buninyong. You can also checkout the Village Market in between acts. Grab something to eat, drink and sit on and be entertained with Shakespeare's Love's Labours Lost for 70 minutes or so. Juggling, dancing and pre-show entertainment, fun for the whole family! Plan to get to the show early and enjoy the pre-show entertainment. Different days showcase different local performers for 15 minutes prior. So bring your picnic and enjoy. The much loved central goldfields band The Winter Berries will be playing on Saturday 9th at 12.45 and Sunday 17th at 12.45. 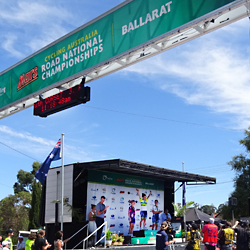 See more in Cycling and visit 2019 Fed Uni Road Nats for the championships results. 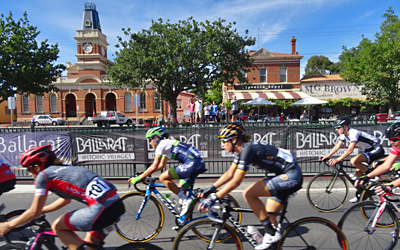 Following the Criteriums in Ballarat on Friday 4 January, the cycling action shifted to Buninyong and District as Australia's top road cyclists flashed through our streets in the National Road Race Championships over the weekend. On Saturday cycling enthusiasts rode the championship course in the MS National Grand Fondo while a family festival drew a large crowd to De Soza Park, culminating in a free film screening at 7 pm. 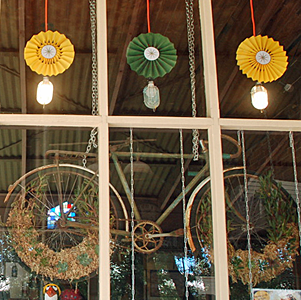 Buninyong geared up for the event with colourful bike-decorations in the streets and shopfronts. The biennial Spring Fair will be held in the grounds of the Uniting Church, Learmonth St. Free entry. Saturday 6pm-9pm: Arts evening with bubbly and complimentary pizzas from the Red Door Pizzeria. “While they work!” will showcase local Buninyong artists working live in the space and displaying their original works for sale. The exhibition will be open Sunday too from 10am to 2pm. 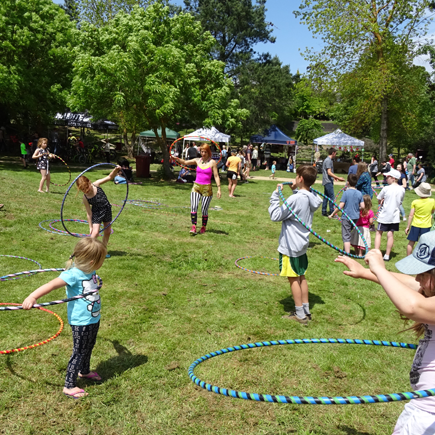 9am-2pm, Buninyong Botanic Gardens. 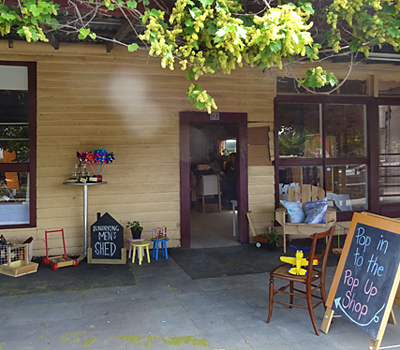 Handmade craft, plants, food, coffee, sausage sizzle, live music. 10am-4.30pm, Yuille Street. In conjunction with Brim Brim, three gardens in Yuille Street will be open to the public - enjoy 3 different garden designs - sustainable, permaculture and contemporary. Tilly Dog Productions presents a contemporary and hilarious pantomime of the classic Brothers Grimm fairytale, Hansel & Gretel! 9am-1pm, Simpson Street Staff Carpark. A fundraiser for the Buninyong Primary School Japanese Trip 2019. 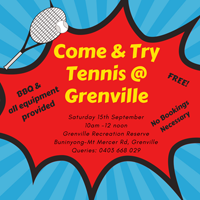 Saturday 15th September, 10am-12noon at the Grenville Recreation Reserve. All equipment provided: it's fun, free there's no need to book. 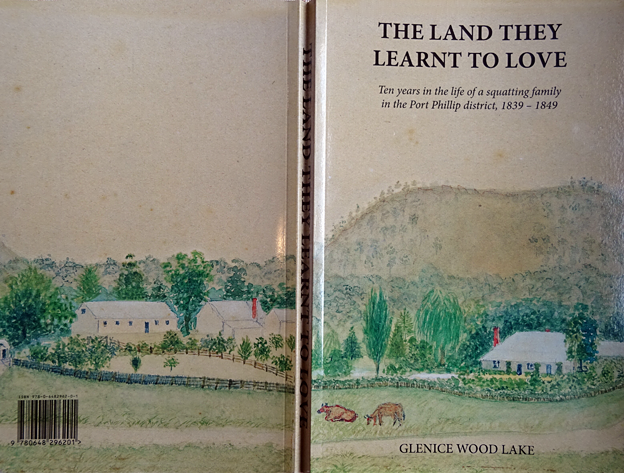 Buninyong historian, Glenice Wood Lake, has published the early history of the Scott family in Scotsburn: "The Land They Learnt to Love". A fascinating story of early European settlement in this district, the book traces the arrival of Andrew Scott and his family in Sydney in 1838, their early years squatting on the Mt Boninyong run and their expansion into the Wimmera at Warracknabeal. Another great mural in the lane off Warrenheip Street. 2pm Saturday 2 June, in the Town Hall. Presented by the Savoy Opera Company. Eye-catching Murals behind the newsagent, Walk in via a lane from Warrenheip Street, or through either the supermarket or the Forest Street carparks. Renovations to the historic M.G. Brown building in Learmonth Street prior to its mid-year reopening as a new restaurant/wine bar, The Shared Table. The weekly Mobile Library visit will now be in the foyer of St Peter and Paul's Catholic Church in Fisken Street, due to the rebuilding of the Warrenheip Street Community House,. Same time each week: 9am to noon, on Saturdays. 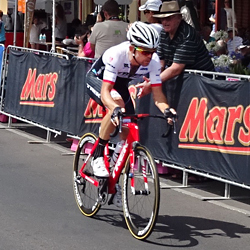 Another big cycling event passed through Buninyong on Friday 2 February. Riders in the Jayco Herald Sun Tour arrived from Warrnambool via Camperdown, Mount Mercer and Durham Lead then did a lap of Mount Buninyong. 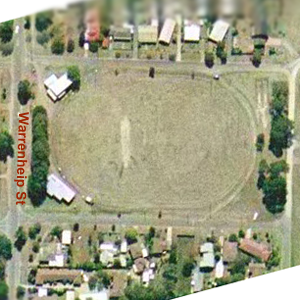 Warrenheip St (between Barkly St and Midland Highway), and Learmonth St slip lane (between Warrenheip Street and Midland Highway, next to Crown Hotel) were closed 10am-7pm and a detour operated via Barkly St and Lumeah Road for the event. Spectators watched an exciting Stage 2 Race Finish in Warrenheip Street which was narrowly won by Denmarks’s Mads Pedersen. This year's Marmalade Fair was held in the Buninyong Town Hall on Saturday 3rd February 2018 at 1pm, sadly for the last time. Selectors announced the winners of a range of highly contested classes and jars of delectable marmalade were on sale as usual but the Marmalade Committee has decided that all good things come to an end and they have wound up the Marmalade Festival after eight great years of putting Buninyong well and truly on the world map of marmalade making. Like to know more about wind farms? Tracey Ward, Community Engagement Manager of Lal Lal WindFarms, is in the Buninyong Information Centre on Mondays (10am to 4pm), Thursdays (9am to 2pm) and Fridays (8am to noon) to meet with people to discuss Lal Lal Wind Farms. Call in to 408 Warrenheip Street to ask questions, raise concerns, find out everything about windfarms - Tracey will be happy to talk with you. See Lal Lal WindFarms website for more info. The 2018 National Road Cycling Races featured a new major sponsor, Fed Uni, a slightly different course, and new categories, community events, activities and participation opportunities for all cyclists and cycling fans. The Championships welcomed two new categories with Australia’s best U19 and Para-cyclists joining the U23 and elite in the battle for the coveted green and gold jersey. ​Australia’s club riders were also able to get involved in the action with the additions of the new Club Teams Time Trial Championships and National Team Relay, while novice cyclists and fans hadf a chance to join in the fun with a host of new rides and activities, including a twilight festival. Thursday 4th January, a “Lap for Lowndesy” was held around the Nationals course in Buninyong, starting next to DeSoza Park at 8.30am, to honour Jason Lowndes, the popular cyclist tragically killed while training near Bendigo just before Christmas. For full information on these events, see the 2018 FEDUNI ROADNATS website. Annual family evening celebrating the Christmas spirit. 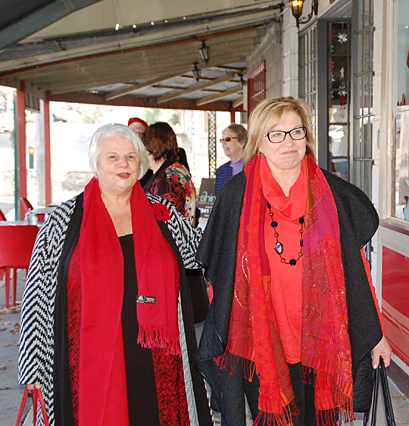 The Buninyong Film Festival presented its first pop-up film screening at the Red Door Pizzeria on 30 November. Guests Enjoyed gourmet pizza and wine before watching "Pizza and Dates", an exotic, explosive multi-ethnic comedy. 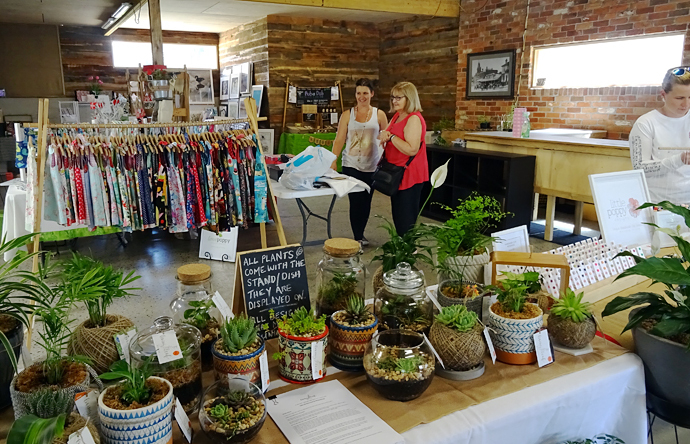 A pop-up craft shop was back in the MG Brown building, featuring local arts and craft wares. Perfect for Christmas gifts and supporting the Buninyong Football & Netball Club. Opened on Wed 29 November at 6pm; then 10am-4pm, Thurs-Sun for two weeks (8pm closing on 1, 8 and 9 Dec) until 10 Dec.
As ever, it was a free and family-friendly day celebrating our local community, with music, amusement rides, animals farms, stalls, food trucks and local community group information stalls. October 2017: Congratulations to the Buninyong & District Community News for its success in this year's Community Newspaper Association of Victoria awards. Our paper was judged winner of the Best Layout and Design and Best Sports Reporting and was a finalist in the Best Feature Story and Best Editorial Comment categories of this year's awards. Well done team! 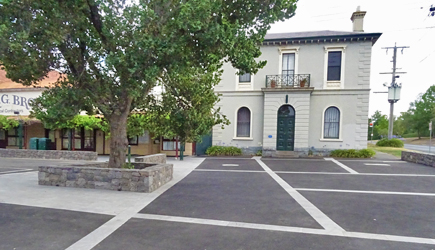 A large crowd turned out to watch and participate in the Community March along Buninyong's restored Avenue of Honour in Learmonth Street on 1 July 2017. 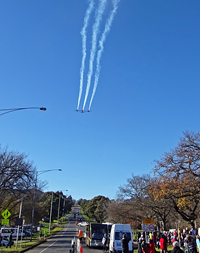 A commemorative ceremony, with a flyover by the RAAF, then took place outside the Town Hall and the Avenue was rededicated to honour the 167 men of the former Buninyong Shire who died in World War I. The Avenue of Honour was originally planted exactly 100 years ago, on 30 June 1917, however it had become neglected over the years and many of the name plaques had disappeared. The Centenary Restoration Project involved researching the names of the local soldiers who had died in the war, clearing intrusive shrubbery and replanting dead trees, placing new plaques on concrete plinths next to each tree, and organising the commemorative march and ceremony. An informative booklet was distributed to all present documenting the district's involvement in World War I and the 3-year project to restore the 1917 Avenue of Honour. 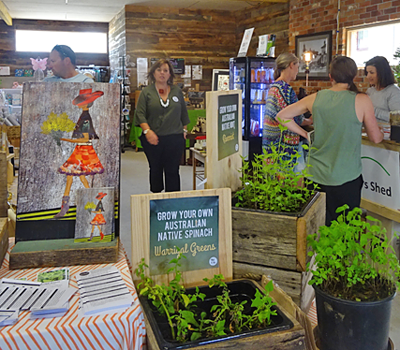 It was full house at the "Imagine Buninyong" session in the Town Hall on June 13. To start the local planning process for the Buninyong Township Plan by the City of Ballarat, the Buninyong and District Community Association (BDCA) engaged Australian community planner/builder Peter Kenyon from the 'Bank of Ideas' to stimulate our ideas about what we want for our community in the future. Peter gave us some inspiring case studies, and started many fruitful conversations about what we want to keep, change and introduce in Buninyong. Peter has worked with more than 2000 communities throughout Australia and overseas to facilitate fresh and creative ways to stimulate a local process of ideas-making. 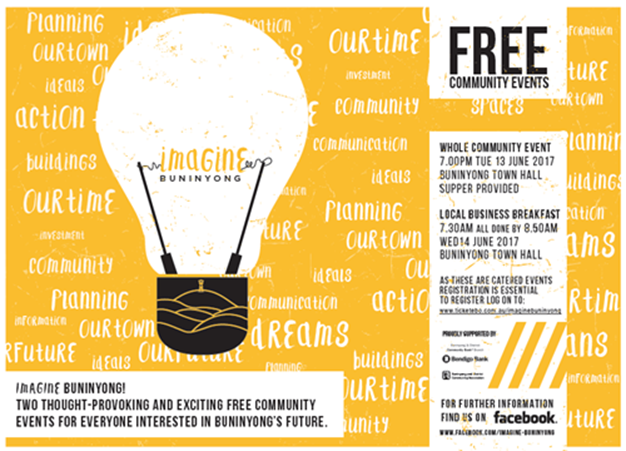 The first Imagine Buninyong session was held in the Buninyong Town Hall on Tuesday 13th June at 7pm with supper. A breakfast session was held on Wednesday 14th June at 7:30am for local businesses. All Buninyong residents were invited to attend. 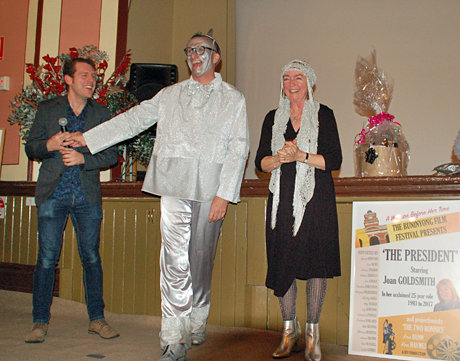 Buninyong's annual Film Festival celebrated its 25th anniversary this year. As well as an expanded lineup of fine films from around the world, audiences were treated to lots of special giveaways and a slice of the spectacular birthday cake. A highlight of the festival for many was the opening night screening of "Tanna" and the Q&A session with one of the directors, Bentley Dean. The Academy Award winning film "The Salesman" from Iran, gripped the audience with its intensity and, among others, the Saturday afternoon gold-coin entry film, "Girl Asleep" was admired for its imaginative style. Joan Goldsmith, who started the festival and successfully reigned over it for 25 years as its President, was cheered loudly as she was crowned its Queen in the closing ceremony and thanked for her long-standing contribution to Buninyong's cultural life. And long live the Buninyong Film Festival! Eight wonderful performances of Shakespeare's much-loved comedy brought magic to the Buninyong Botanic Gardens over two weekends: Friday 10 to Sunday 19 Feb. Directed by Susan Pilbeam, the play was a delight from start to end, as it moved through the Gardens, from the Rotunda to the lily pond to the walled garden. Experienced actors played the lead roles, including several performing arts graduates from Federation University, sweetly supported by a flock of musical sprites from Buninyong Primary School. All credit to the organisers, cast and crew. We look forward to another appearance next year, as promised. 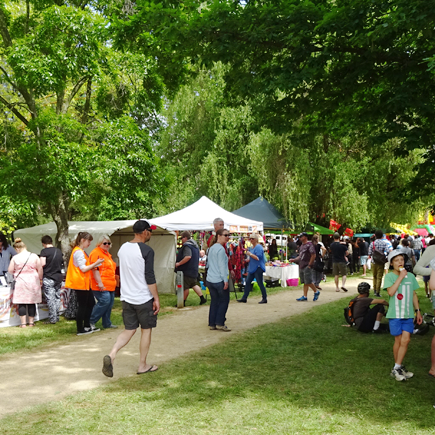 Marmalade makers from around Australia and local marmalade lovers were out in force at the Buninyong Marvellous Marmalade Fair this month. 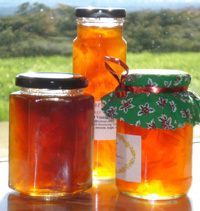 Prizes were awarded in many categories and Australia's top marmalades competed for selection in the team to tour to the International Marmalade Awards in Cumbria. Many delectable marmalades were for sale, too. See the MarmalAshes website for more info. Full results coming soon. An appreciative audience relaxed in the shade of the Buninyong Botanic Gardens while watching Tripwire Theatre's Travels with My Black Dog on Sunday 22 January. Katrina Hill had the audience playing ball with her in her role as the lively, affectionate dog - a very enjoyable performance! Travels with My Black Dog is a free family comedy with a heart of gold which uses humour to shine light on the realities of living with depression. Tripwire Theatre Inc.’s latest touring production is a two-person performance, written by Bjorn Worpel and Megan Riedl. It is comedic work, despite dealing with a serious topic: depression. Travels with My Black Dog will be performed in Buninyong at the Botanic Gardens on Sunday the 22nd of January at 6.30pm. Flashes of lycra whizzed through our streets again as super-fit cyclists competed in the road race championships in January. See Cycling Australia for the latest updates and Cycling for more info. 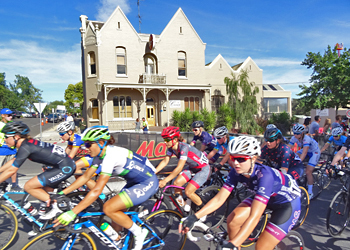 Road closures, traffic diversions and parking restrictions are in place throughout Buninyong during the races for the safety of the cyclists, spectators and road users. One year after the horrific fires around Scotsburn, a poignant exhibition of photos and art works by local residents documenting their experience is on display in the foyer of Village Place, next to the Town Hall. 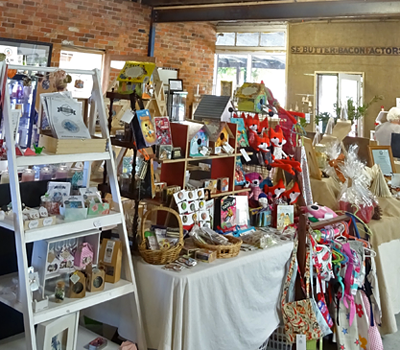 A cute popup shop in the newly-restored space between Espresso Depot and Yellow Rose in Learmonth Street was open 10am-4pm until Sunday 4 December 2016 with a gorgeous range of quality giftware - ideal for Christmas shopping. 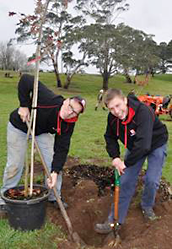 Staffed by volunteers, it was a fund-raiser for the Buninyong Football/Netball Club. September: Wonderful to see our lovely Gong full again and Lal Lal Falls in full flow. The frogs in the Gong are very happy - you can't miss their rousing chorus of croaks as you pass by. Many people have also gone out to Lal Lal to watch the Lal Lal Creek, now swollen into a torrent, thundering down the falls before winding its way through the gorge into the north-west arm of Lal Lal Reservoir/Bungal Dam. Spectacular! Historian Anne Beggs-Sunter unveiled a plaque commemorating the 150th anniversary of one of Buninyong's longest surviving houses on Friday 30th September. Built in 1866 by Robert Ogilvie on 10 acres on the flanks of Mt Buninyong, the cottage is remarkably intact today. Joan Ogilvie spoke to a crowd of interested observers and members of the extended Ogilvie family about Robert and Jean Ogilvie's early arrival in Buninyong, their marriage by Rev. Hastie in 1855, and their family history. She also thanked the present owners, Mr & Mrs Michael McKee, for helping to preserve the well-built cottage so that it stands as a tangible reminder of Buninyong's early days. Lisa Cressey, Vice-president of BGLF, said the market will run from 9am to 1pm on the last Sunday of each month, from September to May. 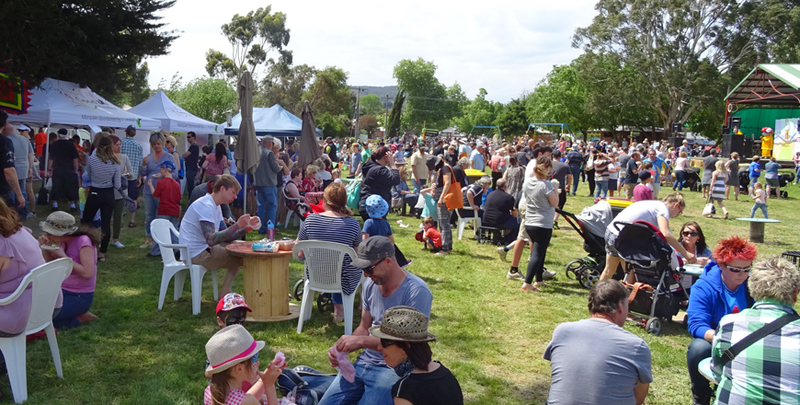 In December a special twilight market will be held on Saturday 10 December to coincide with the Buninyong Christmas Carols in Desoza Park. 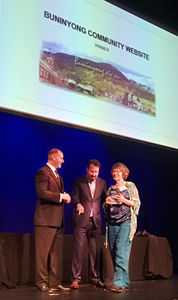 Tuesday 30th August: The 2016 Australian and New Zealand Internet Awards (ANZIA) were a big night for Buninyong as the Buninyong Community Website (yes, this site!) won the Leonie Dunbar Memorial Award for Community Websites at a Gala Dinner held in the Plaza Ballroom in Melbourne. Many internet luminaries were at the dinner and awards were presented in six categories. In her acceptance speech, Liz Lumsdon, the website's designer and co-ordinator, thanked the many people in Buninyong who contribute to the website and help to make it truly representative of our community. With hundreds of community websites in Australia and many more in NZ, ours was a big achievement and one we can all be proud of. Victorians will also be chuffed that Harcourt Valley Community Website was Highly Recommended on the night. The handsome crystal trophy is now on permanent display in the Buninyong Information Centre. How many venues are available for hire in Buninyong? Five? Ten? You might be surprised! 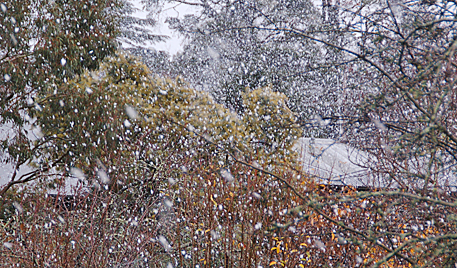 Wednesday 13 July: Buninyong woke up under a light blanket of snow giving kids of all ages lots of fun throwing snow balls and building snow-gnomes. The snow melted away fast in the sun but lasted longer on the Mount where some real snowmen briefly appeared. Friday 8th July: The Mayor of Ballarat, Cr Des Hudson, Cr Peter Innes, sculptor Cliff Burtt, and Michael Ford of the Arts Buninyong Group, all commended the handsome sculptures when speaking to the small crowd braving the wintry wind at the official unveiling in Buninyong's main intersection. 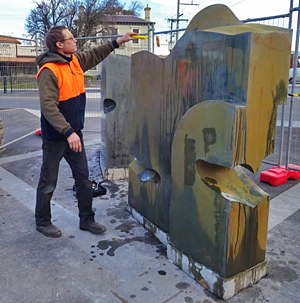 Michael Ford said he was overjoyed to see a public display of creativity in the town and the speakers also praised the behind-the-scenes efforts of Julie Collins, Public Art Coordinator of the City of Ballarat, who helped to bring the project into fruition. The group of sculptures reach 1.6 metres high and stretch eight metres across and are designed to encourage interaction from pedestrians. According to Cliff Burtt, “The profile of the sculpture is based on topographical mapping of the area ... the gaps between the elements of the work can be viewed as representations of the shafts sunk into the earth by gold miners”. 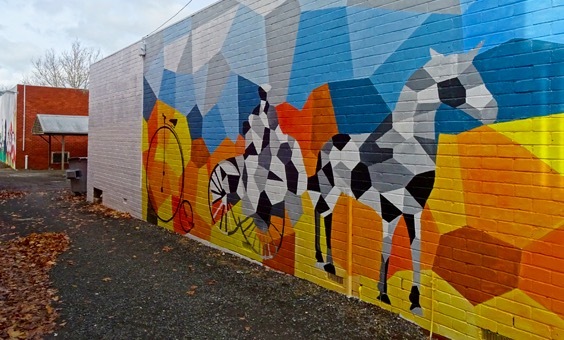 The much-admired project was funded from the Council's Engaging Communities Program and Public Art capital budget. 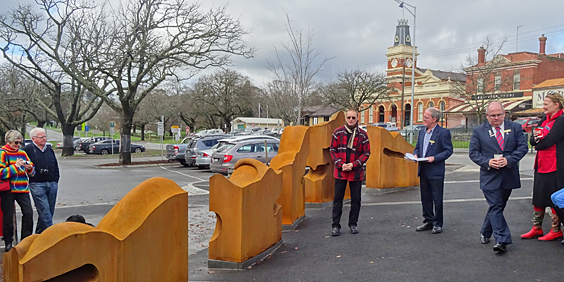 Council workers then sculptor Cliff Burtt himself have been busy on the north east corner of Buninyong's main intersection installing the long-awaited street sculptures. Cliff explained that he was applying a weak acid wash to increase the patination of the welded steel cor-ten sculptures, giving them a rust-like weathered appearance. 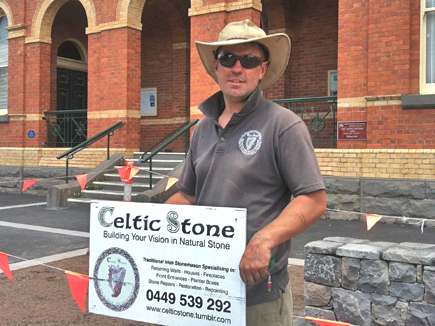 The sculptures are an exciting addition to Buninyong's town centre that are sure to provoke a lot of interest. 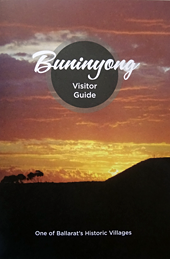 With funding assistance from Ballarat Regional Tourism (BRT), the Buninyong & District Community Association (BDCA) has produced the third edition of the Buninyong Visitor Guide. The fully-revised booklet sports a fresh new look inspired, in part, by the new 110 page Ballarat & Surrounds Visitor Guide produced just a few months ago. The new edition was launched by BRT’s recently-appointed CEO Noel Dempsey, on 8 July at the Red Door Pizzeria Restaurant in Buninyong. June: The One Million Stars To End Violence Project has officially concluded in Buninyong after brightening our streets for the last three months, but many shops and organisations have chosen to keep their displays on show until the stars get packed up to go to Brisbane. Rosie Batty, Anti-Violence campaigner and 2015 Australian of the Year, visited Buninyong in the previous week to see the project on display in Buninyong's streets. 24 June: The Mayor of Ballarat, Cr. 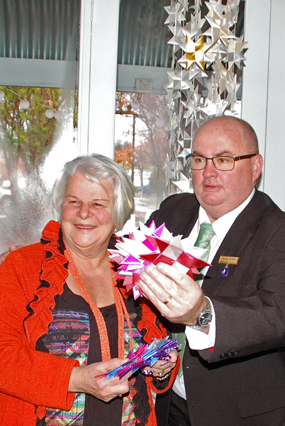 Des Hudson, officially drew a close to the 1 Million Stars To End Violence Project in Buninyong today. At a small ceremony celebrating the success of the project, the organiser, Lidia Aitken, explained that the project had been intended to run for only three months in Buninyong, however some local organisations have chosen to keep their stars on display here until they all get packed up to go into a million-star installation that is being prepared for the 2018 Commonwealth Games on the Gold Coast. A team of 20 star-weavers in Ballarat and Buninyong, with a core group of eight, have been creating the stars for several months: each star takes 5 minutes to weave. 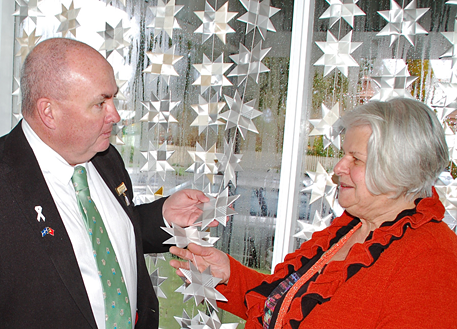 The weavers have a target of 10,000 stars for delivery to Brisbane by the end of this year. Over 5,000 stars spread across more than 50 locations in Buninyong have put on a remarkable, and beautiful, show of community solidarity with the project's aim of countering the levels of domestic violence in our society. 14 June 2016: Domestic violence campaigner and 2015 Australian of the Year, Rosie Batty, visited Buninyong to meet the local star-weavers behind the 1 Million Stars To End Violence Project and to see Buninyong's amazing community effort in publicly supporting the Anti-Violence campaign. Impressed by the level of support for the campaign, Rosie stopped and chatted to several shop-owners and representatives who came out to meet her on her walk around town. During a coffee break at The Old Bluestone Café, the star-weavers treated her to an impromptu lesson on how to create the stars. Rosie then went to Ballarat to launch the anti-violence campaign by Berry Street Family Services: Ballarat is no place for violence which focuses on the effects of family violence on children. 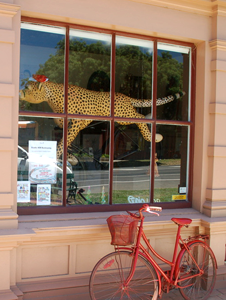 April-June 2016: Most of Buninyong's shops and offices contributed their windows, making a brilliant display. Groups of dedicated star-makers worked diligently for months, weaving thousands of stars to support the One Million Stars To End Violence project. 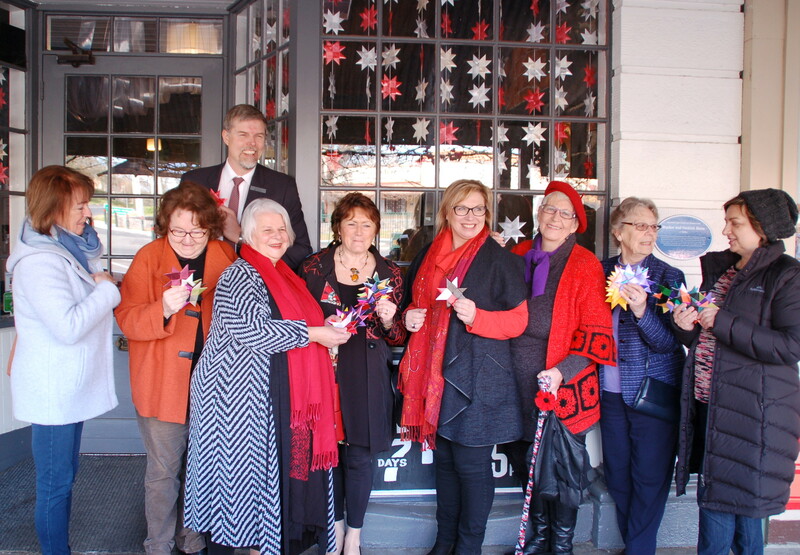 In a remarkable effort of community solidarity, nearly all of Buninyong's shops and organisations have got behind the project, displaying the stars in their windows along Learmonth and Warrenheip Streets, with some in side streets too. Have you seen their gorgeous displays, pictured above? It's not just for decoration! It's a wonderful sight but there's a serious purpose underlying it. All of the participating organisations also display an accompanying explanation about the anti-violence project. It's worth reading! 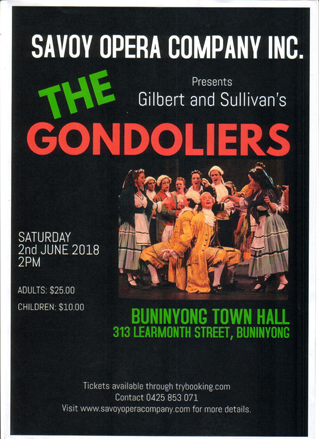 Buninyong Bakery, Buninyong Community Bank, Buninyong Fish Shop, Buninyong Foodworks supermarket, Buninyong Hair & Beauty, Buninyong Golf Club, Buninyong Information Centre, Buninyong Men's Shed, Buninyong Newsagency, Buninyong Pizza & Hamburger House, Buninyong Post Office, Buninyong Pre-school, Buninyong Police Station, Buninyong Primary School, Buninyong Town Hall, Celebrate!, Chocalatto, Divine Vintage, Espresso Depot, Fig Leaf Café, Pig & Goose Restaurant, Harcourt RE, Hill View Lodge, Lions Book Store, PRD Nationwide RE, Red Door Pizzeria, Remedial Massage, Sew Special, Shine Hair & Beauty, Steiner School, The Old Blue Stone Café, UFS dispensary & Doctor's surgery, Vagg's Garage, Village Place, Yellow Rose Beauty Salon ... and there are more to come! It was a great line-up of films, as ever, and the night sessions were booked out. Program details are on the Film Festival website: Buninyong Film Festival. See photos from this year's festival in the Buninyong Film Festival Photo Gallery. Next year will be the 25th Film Festival in Buninyong and it will be BIG! The Virginia creeper twining along the shop fronts looks brilliant, even the fallen leaves look beautiful. A wonderful annual event where marmalade-makers from all over Australia vie for selection in the team of Aussie marmalades that will compete at the International Marmalade Awards in Cumbria. Winners were announced at the Fair in a wide range of mouth-watering categories (eg Seville, Cumquat, Three-fruits) as well as the touring team for this year's MarmalAshes. Jars of delectable marmalade from top marmalade chefs will also be on sale. Buninyong Town Hall at 6pm. All welcome - no rsvp required. Community BBQ afterward. Dr. Rob Gordon, clinical psychologist and experienced disaster recovery expert, will give an understanding of how disasters affect people and communities, the recovery process and how to get extra support. Recovery Centre: Buninyong Community House, 407 Warrenheip St, Buninyong. 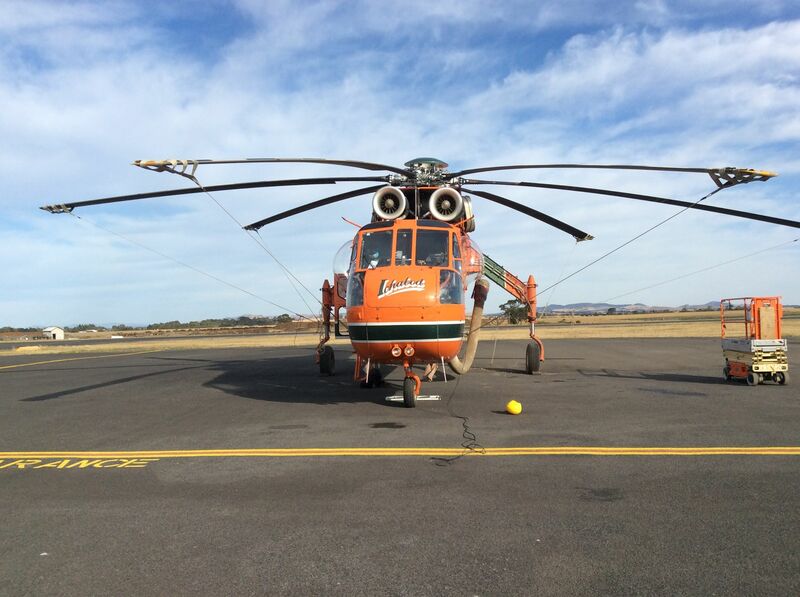 Pictured at Ballarat airport, the chopper helped crews on the ground tackle the Scotsburn fire. Thank you to all our wonderful fireys who battled the fires heroically at Scotsburn, Durham Lead, Clarendon, Mt Doran, Elaine and Mt Mercer in terrible weather conditions. Much sadness for those who have lost their houses, stock and fencing. 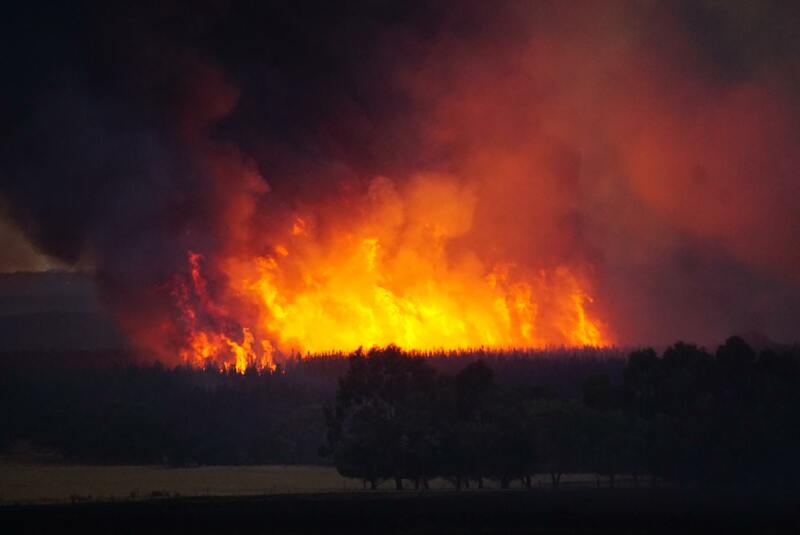 Support has been pouring in and donations can be made at the Buninyong Community Bank in Warrenheip St.
31 December: The CFA advised that the Scotsburn fire is under control. The clearing of roads has allowed residents access to their properties. CFA fire-fighters continued to patrol the fire area. 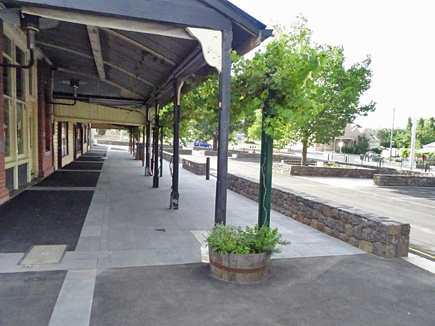 Buninyong Town Precinct Upgrade - it's finished! 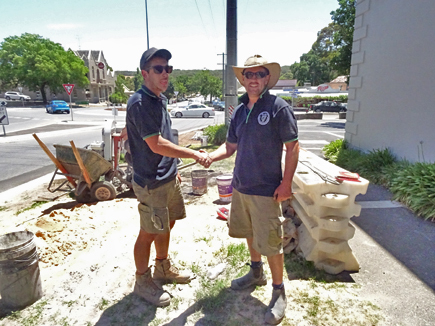 After several months working in all sorts of weather, Paul Nolan and his crew signed off on the Buninyong town centre upgrade on 15th December, in time for Christmas then Buninyong's next big event - the bike races in January. A job well done! Sculptor Cliff Burtt positions models of his street sculptures in the newly-upgraded north-east corner of Buninyong's town centre. But debate is growing about where they would be best placed: there is clearly more room on the south-east corner, in front of the old bank, rather than in the smaller and more congested space on the north-east corner, as first proposed. What do you think? 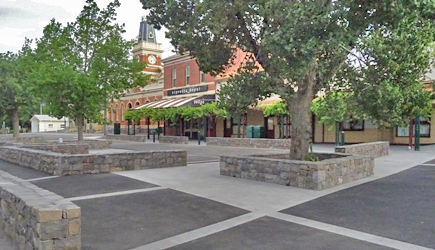 The north-east corner of the main intersection is almost finished: the barriers have gone, the new paving, low stone wall and tree enclosure are looking good. Now we're just waiting for the grass to grow and the street sculpture by Cliff Burtt to arrive (and hoping that the drainage will cope if we have a major deluge). All the pedestrian disruption, noise and construction have suddenly shifted to the south side of Learmonth Street. What's happening behind those hoardings? 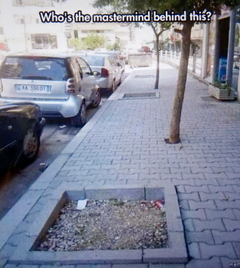 Let's hope we don't end up with street plantings like those on the right! No way that could happen here, surely! What do we want for Desoza Park and Royal Park? Both these important recreation areas are currently under redevelopment by the City of Ballarat and local input is essential if we want good results. 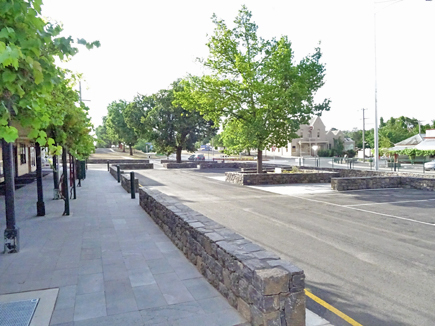 The City of Ballarat is undertaking a Facilities Plan to assess infrastructure requirements, landscape opportunities and priorities for Royal Park. Community members are invited to come along and have their say about the future development of Royal Park at an open house session to be held at Royal Park on Monday 7 September, 4 - 6 pm. 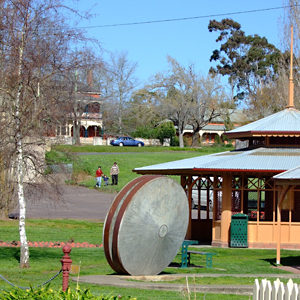 Both these parks are vital to Buninyong's present and future recreational needs. Make sure that Council hears what we want for these valuable community assets and ensure that they are developed properly. Readers of the Buninyong Newsletter and local history lovers will be pleased to know that a full set of the first 387 printed editions of the Newsletter (July 1977-August 2012) have now been safely archived in the State Library of Victoria. Collectively they are a treasury of stories and images about Buninyong's growth over those 35 years and it's reassuring that they will be preserved for posterity. Thank you to former editors Betty Schreinzer and Ann Gooding for providing this complete set of early print editions for the Library's archives. The current editors also send print copies to the Library each month since February this year. Back copies of all digital editions since August 2012 are now available online on this website at: Newsletters 2012-2014 and Newsletters 2015. Cones, diggers, mysterious graffiti on the footpaths and workmen everywhere ... what's going on? Yes, the NBN is rolling through Buninyong and Mt Helen. 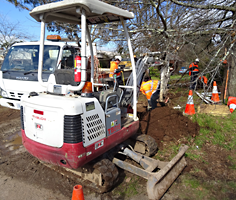 Many streets have already been dug up for the conduit that will house the fibre underground. 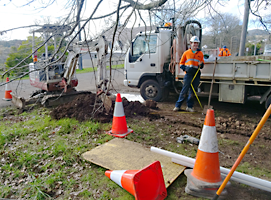 Thankfully, the main intersection is being prepared before the Council start digging up the same area for their Buninyong Town Precinct Upgrade Project. Some sections were too rocky for the conduit installation crews to be able to dig under the roads at first and they had to call for larger drilling machines. "We looked it up and discovered we were working at the foot of an extinct volcano!" they groaned. "It was much easier going in sandy Shepparton where we were before." "Tell us about it," locals reply, pointing to their rock piles and retaining walls. 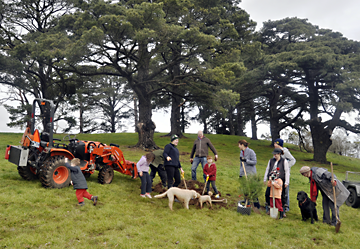 Lots of people dug lots of holes in Birdwood Park on Mt Innes to plant a copse of trees commemorating Derick Leather, former Shire of Buninyong councillor and tireless worker on numerous local projects including the restoration of the Old Buninyong Library; the development of De Soza Park; maintenance of the Buninyong Cemetery, Swimming Pool, Mt Buninyong Reserve, Botanic Gardens and street tree plantings; researcher and regular contributor to the Buni News. 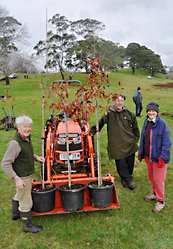 The working bee was organised by the Friends of Buninyong Botanic Gardens with funds from the Ballarat City Council. 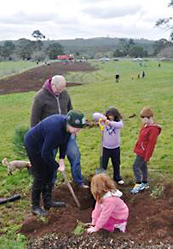 Pictured: Peter Hiscock, Stuart Crumpler and Julie Richardson; Stuart’s tractor and other diggers; Melinda Tant and Mayanna Lakerink digging a hole big enough for a pine tree with Paul, Sienna and Luke Tant; Des Sunderland and Sam van der Linden, Buninyong CFA. Photos by Russell Luckock. New shops are opening, a pedestrian crossing is being planned for increasingly busy Warrenheip Street near the Post Office, and the walled garden in the old swimming pool area of the Botanic Gardens is still fenced off! 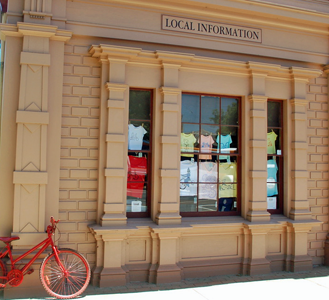 Welcome to the new version of the Buninyong Community Website. Most of the material from the original site is here, plus a whole lot more, with still more to come. 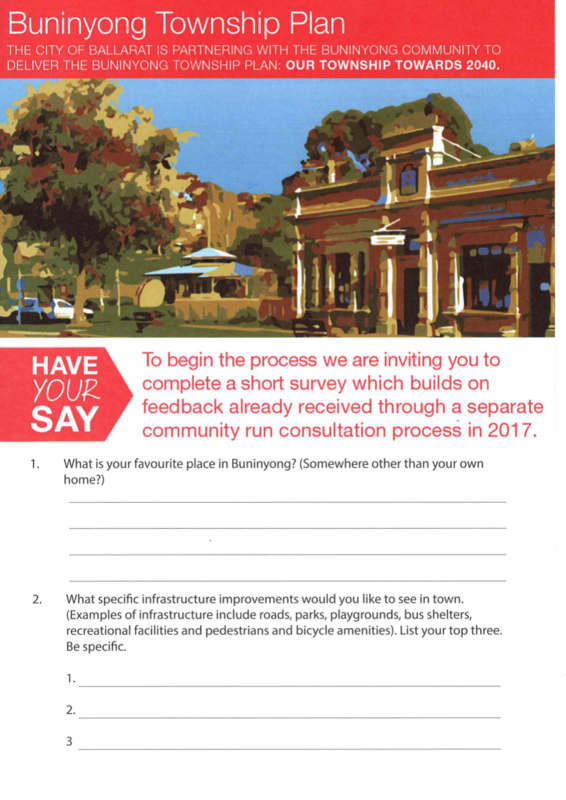 The new site still needs fine tuning and will keep changing as Buninyong changes, but right now we'd like your feedback. 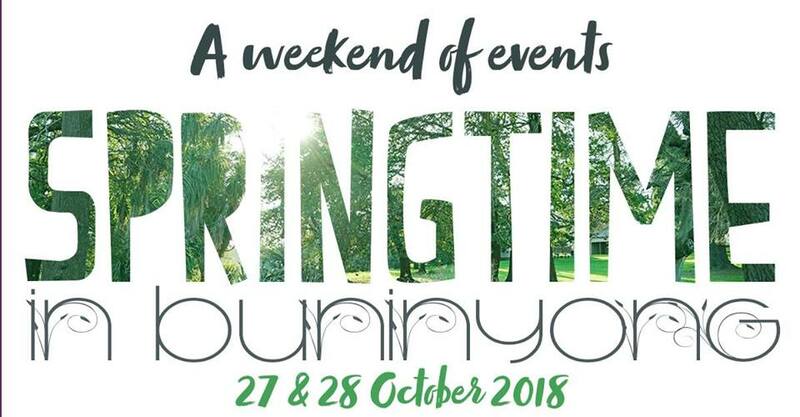 The website aims to be an up-to-date and reliable source of information about Buninyong and the surrounding district, for visitors and local residents alike. And for this we need the ongoing help of Buninyong locals and friends.